Chocolate or Vanilla: What Difference Does a City's "Flavor" Make for the Most Vulnerable Populations? The front page of today's Washington Post highlights the changing racial composition of the District of Columbia, once dubbed "Chocolate City." But Washington, D.C. isn't the only city that is confronting change. Over the last two decades of the twentieth century, a number of U.S. cities became majority black. The Census data released during this past decade indicate that several of these “chocolate cities” are now moving in the opposite direction—going from chocolate to vanilla. This fact has alarmed some, but should it have? Why should we care about the changing racial composition of our cities? When people of color became a major force in some cities, it was viewed as a means of gaining political power and, in turn, access to economic resources to improve the population’s well-being. Early on, that led to ambitious plans to improve the public schools, eliminate poverty, and move residents into more stable, higher paying jobs. In response to the popular question, “how did that work out for you?” the response has generally been “not so much,” at least not in the short run. But over the long haul, some cities have generated more economic activity and attracted more residents. Some of these successful cities are the same ones that are now seeing a drop in the proportion of African American residents. Does this mean that African Americans are being displaced just when the economic and social benefits of living in the city are going up? Or will those left behind lose their political clout as their numbers dwindle? It’s not that simple, as the numbers show. For example, if you take nine cities that were at least half African American in 2000 and look at what has happened in the past decade, you’ll see several different stories. 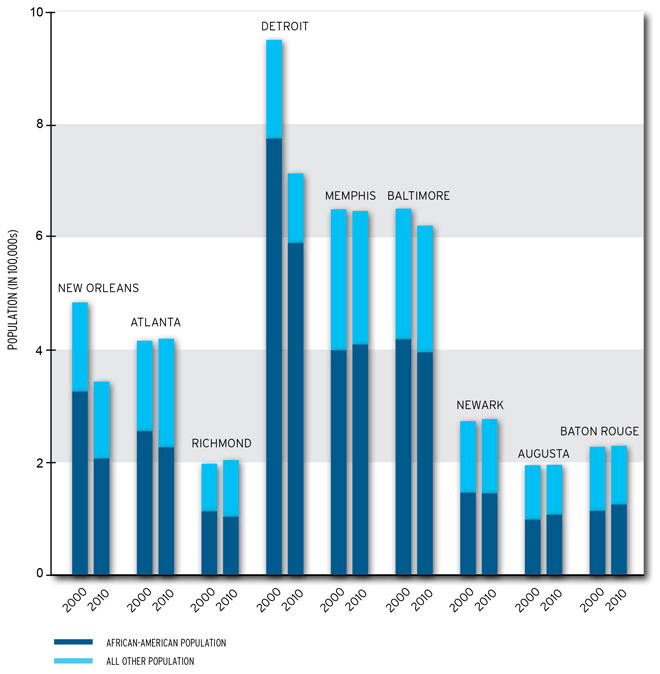 Five of them—New Orleans, Atlanta, Richmond, Baltimore, and Newark—saw declines in the proportion of the population that was African American, while four—Detroit, Memphis, Augusta, and Baton Rouge—had increases. But the details differ. In Atlanta, the overall population grew slightly but the African American population fell significantly. Metropolitan Atlanta enjoyed strong economic growth, which likely attracted people. While displacement can’t be ruled out, African Americans who remain in the city are likely—with the proper supports—to benefit from that growth. And the city government might be positioned to tap that growth to expand access to opportunity. Detroit represents the other extreme. The percent of the population that is African American increased, but only because a larger proportion of the nonblack population crossed the city limits. Economic opportunity plummeted in the Motor City, so the municipal government has fewer resources to strengthen either the safety net to support the most vulnerable left behind or the “trampolines” that would boost them to a higher level of economic security.